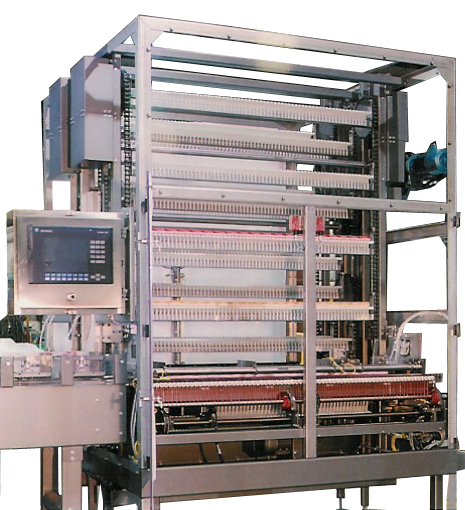 Dillin’s First-In, First-Out (FIFO) Accumulator utilizes a carousel design and can handle a full range of container and product types and sizes. Fitted with our patented RWave® transfer system, it gently places products on lift rails, eliminating any pushing and allowing for multiple rows of product to be accumulated on every rail if required. The FIFO Accumulator features a compact footprint while maintaining hundreds of feet of accumulation. Its open access and clear visibility enhances operator safety and efficiency. This FIFO Accumulator can be integrated with Dillin’s: Product Handling Conveyors, Merge/Divert Stations and/or Incline/Decline Conveyors. Handles a full range of container and product sizes. First accumulated product is the first out of the accumulator during de-accumulation. Patented RWave Transfer Technology facilitates gentle and precise product placement. Loading and unloading are independent of one another. Satisfies FIFO requirements of batch processing with the first product in being the first product out.